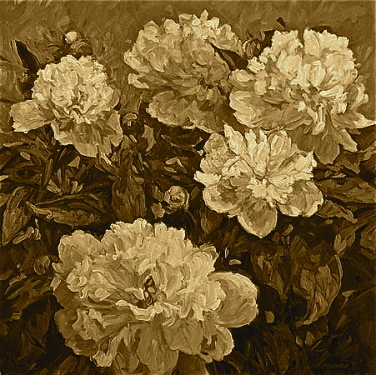 A Year of Being Here: Jane Kenyon: "Peonies at Dusk"
Jane Kenyon: "Peonies at Dusk"
"Peonies at Dusk" by Jane Kenyon, from Constance: Poems. © Graywolf Press, 1993. Hello Phyllis, This is a lovely poem. I keep a sporadic journal and have used the same technique you so beautifully offer in your blog, verse and a picture. The deep reserve you reached into for this daily blog is remarkable. And your kind commitment to share through your blog is something that never even occurred to me. It was a great moment when I discovered what you had done. In my also sporadic journey through the days you have on offer I have again and again been struck by the images. Do you have image databases that you go to or are they, like your poems, just the accumulation of years of looking? Hi, Dan! Thank you for your kind words. To answer your question, while I was doing this blog I just browsed the internet. It's amazing what's out there. I tried to credit people's work when I could, but to be honest, I probably shouldn't have used any of it without seeking somebody's permission. I simply didn't have the time to research all that, so I sinned bravely, hoping that if I gave credit, it would make amends. Anyway, I'm glad you're enjoying the blog and happy to hear that this is a technique familiar to you from your own journaling practice. Be well. I know what you mean about credits. There is no easy way. I think the publishers and image creators and aggregators are behind the digital curve. I think they could do much better if there was a mechanism like iTunes for poems and images: 99 cents for limited use in a blog or for use in a digital birthday card, say. I'd gladly pay. I do much the same as you. I try to be very careful about crediting for the limited use I generate. 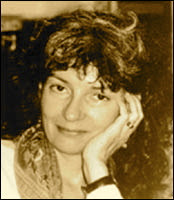 Ellen Kort: "Advice to Beginners"
Naomi Shihab Nye: "The Tray"
Wislawa Szymborska: "No Title Required"
Erica Jong: "You Are There"
Todd Boss: "This Morning in a Morning Voice"
Hannah Stephenson: "First Things First"
Ralph Murre: "What Is Given"
Gary Snyder: "What Have I Learned"
Billy Collins: "In the Moment"
May Swenson: "Staying at Ed's Place"
Kate Rushin: "The Bridge Poem"
Larry Schug: "Threading the Needle"
May Sarton: "Now I Become Myself"
Marie Ponsot: "Out of Water"